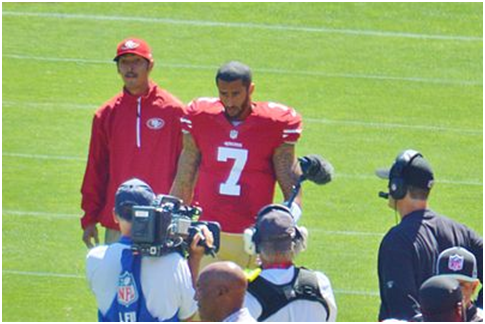 The NFL national anthem protests, which began before a 2016 preseason game with then 49ers quarterback Colin Kaepernick, and came to a head last week after inflammatory comments by President Trump, continued into week 4 of the NFL season. While the words were met with cheers and applause from the crowd, his comments were largely met with disgust and outrage. Even those who had supported Trump politically, such as former NFL coach and current ESPN commentator Rex Ryan, said the president’s words were wrong and inappropriate. They spurned a league-wide response in week 3 in which teams across the country linked arms during the anthem as a sign of unity. Many team owners who supported Trump’s presidential campaign–including Daniel Snyder, who donated $1 million–participated in the protests, some even stating they were disappointed in his comments. While the protests continued this week, they have shifted amidst controversy and calls for the NFL to be boycotted, or even — as Trump exclaimed — fired. The main reason for the shift, however, is the confusion that the protest is meant to be a peaceful stand against police brutality and the treatment of minorities in this country, not the flag or anthem itself. After 180 players knelt in week 3, only 52 knelt this past weekend. Some teams, such as the Ravens and Steelers opted to kneel before the anthem, but stand during it. Some players lifted their fists during the anthem, or continued to take a knee while the majority of their team stood. Athletes in other sports have spoken out about the NFL “Take a Knee” movement, all of them focusing on the message behind the protests, instead of the action itself. NBA super star LeBron James said he was proud of the display of unity from the NFL last week. Kaepernick, who remains a free agent since opting out of his contract with the 49ers in March, has stayed mum on both Trump’s comments and the on-going protests. However, the former quarterback has retweeted several articles on his Twitter account, many of which highlight the true meaning behind the protests. While he remains off the field, his fellow athletes, celebrities, and every day people continue to spread his message, hoping to invoke meaningful change.